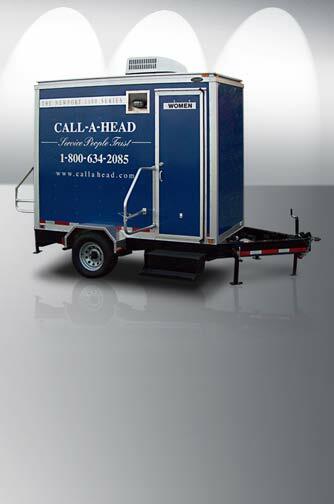 After extensive research in the portable restroom trailer industry, CALLAHEAD has developed the next generation of portable restrooms. CALLAHEAD is proud to launch The Newport 1100 Series, exclusively from CALLAHEAD Corp.
CALLAHEAD’s Newport 1100 Series of restroom trailers offers the comfort of a permanent structure with the convenience of portable sanitation. The Newport 1100 Series features finishes such as faux marble, stainless steel, white ceramic fixtures and faux mahogany wainscoting, together imitating the great catering halls of the New York area. The Newport 1100 is also reminiscent of Newport, Rhode Island during the gilded age. This gives the trailer the feel of that era, making it the most elegant restroom trailer available in the market today. Water and electric can be supplied by CALLAHEAD with 2-300 gallon fresh water tanks and a 100 AMP generator. 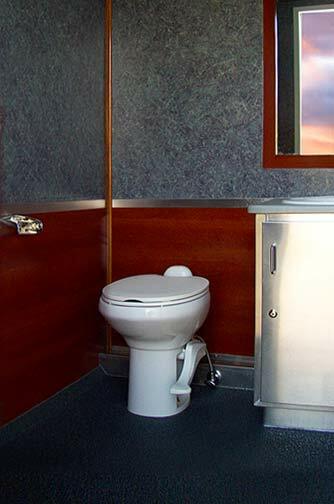 This Restroom Trailer is available for all short term or long term rentals. Designed to function consistently under an enormous amount of use. Ready for immediate delivery. Can be delivered fast and set up even faster. Always in stock. 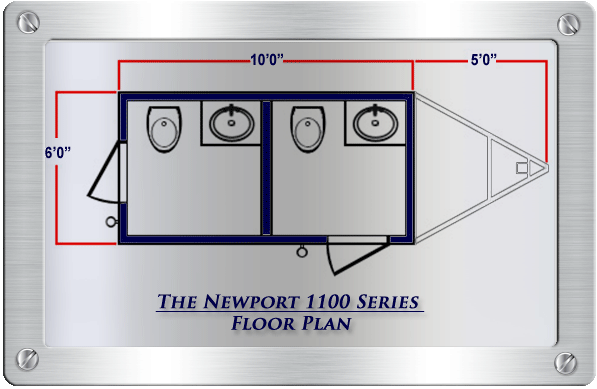 The Newport 1100 Restroom Trailer is functional, economical, comfortable and reliable. The Newport 1100 Series Bathroom Trailer arrives completely loaded with liquid soap, paper towels, toilet paper, and empty lined trash cans. All comfort and convenience of any beautifully appointed public bathroom. Also available with head attendant service to maintain The Newport 1100 Series while in use. 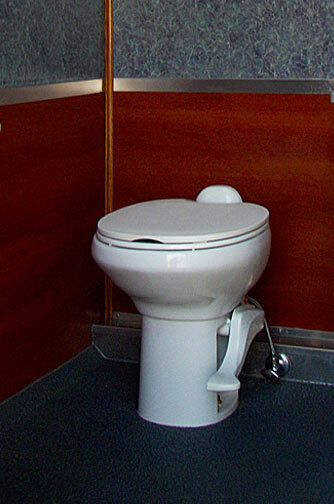 Depending on use, the Newport 1100 Series Restroom Trailer can be serviced weekly, daily, hourly, or on call. The Newport 1100 Series includes heating & air conditioning, two custom sink vanities with automatic hot & cold water and stainless steel cabinets underneath, exterior & interior lights, two paper towel dispensers, and two soap dispensers. It also includes ventilation, a stereo sound system, two automatic flush porcelain toilets, one automatic flush urinal, A-pex plumbing system, decorative mirrors, and a rich navy blue exterior with silver leaf signage, which in all, creates an opulent feel which will completely overwhelm your guests. 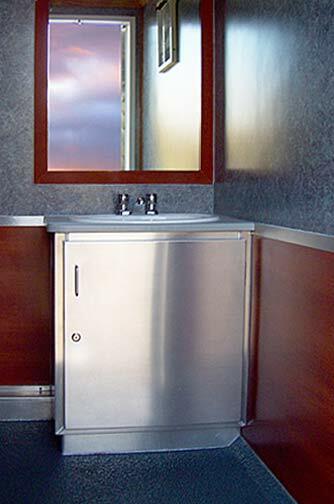 The Newport 1100 Luxury Restroom Trailer maintains to a compact size which makes the unit easy to maneuver and gives it the mobility to go virtually anywhere. Let CALLAHEAD and The Newport 1100 Series help put your event above and beyond all your expectations for that great day. Call CALLAHEAD today. Porcelain Sink with Hot & Cold Water!